My kids are so into crafts right now, and we love to merge cutting and drawing with play! Our toys need jazzing up sometimes, like sticking on bits of paper and giving them a new hairstyle! Or else we spend time making a whole playscene, with roads, shops, and trees. 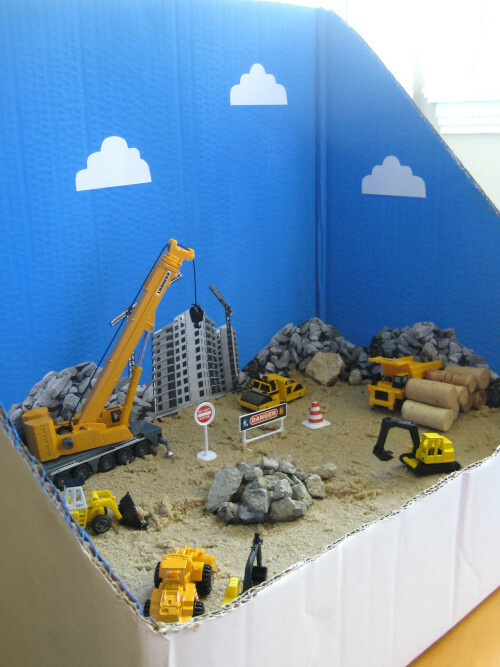 Here are 8 ways your children can make their own playscenes too! I love these play scenes since they encourage kids to recycle craft materials, while using their imagination, and drawing or painting. My kids spend so long creating the perfect scenes. Then the business of playing in the new world passes even more time. These are perfect rainy day activities, or if you are cooped up due to chickenpox. There are 3 ideas in this video – scenes alongside a train track, super hero town and a city. Watch how these children are making their own play scenes and having a fabulously fun time while they play with their creations. 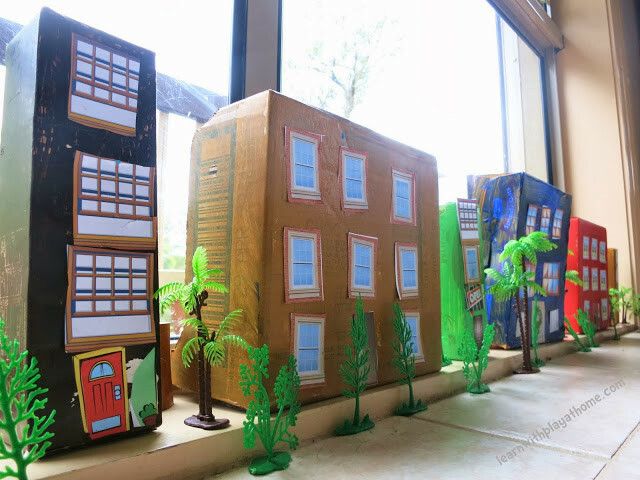 Learn to Play at Home uses little boxes to make a 3D town. Some boxes ready for the recycling bin, a bit of paint and some paper had been transformed into a beautiful little city. Debs also explains which skills children use for each element of the creation, too, so you can be sure your kids are learning through play. This car wash is fab! 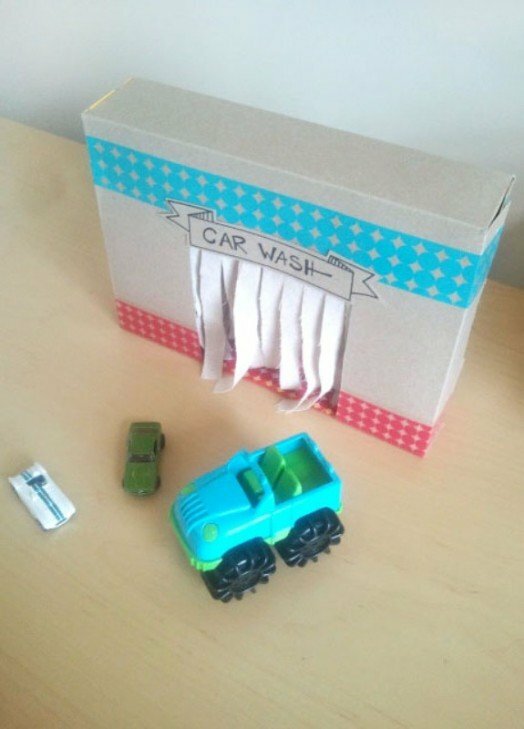 You will need a cereal box and a couple of toilet rolls as well as some paper to create the washer brushes. Add some paint, paper and imagination, and soon all the vehicles in toy town will be sparkling clean. This post by Kidsomania includes instructions that kids can follow. This one is actually something you can buy and the children customise it. I really think you can make it yourself: have a look here. All you’ll need is some thick cardboard for the outer house shape, and thinner card for the “pages”. Draw on some windows if you like, or leave that for your child. This amazing scene by Roar Sweetly might need a bit of help from you to cut the shape of the box, but I think kids would love to help you with painting the sky. They could also cut out buildings for the backdrop, and stick them in place. All the instructions are included in this post, although I think it would be a brilliant space to play with kinetic rocks or sand, as well as ordinary play sand. 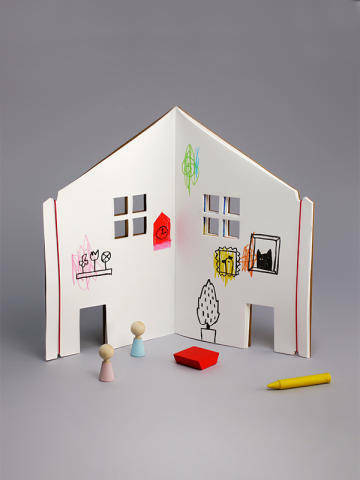 These play scenes are sure to be a big hit with your kid, if they like crafting and playing!